El dia de la Virgen de Guadalupe had passed by a mere three days when we decided to have a Mexican feast. Our new wooden tortilla press from La Michoacana in East Austin, Texas, faced its first real test: enough authentic Mexican tortillas to make a tray of enchiladas. We had dabbled with the press since bringing it to Buenos Aires in our backpack after Thanksgiving, making tentative orders of small, thick tortillas for "sopes'' and a few tortillas to be used as a substitute for bread with a Cuban dish, picadillo. These early efforts emboldened us. 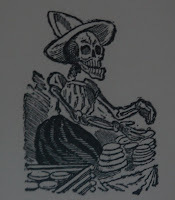 Using the masa de maiz we had brought back with the press, Kurt made around 15 tortillas. The process is not hard but requires a deft touch. You mix a little water with the masa, knead this for a couple of minutes till you get the right consistency, then form small balls. Next, using the press, turn each ball into a tortilla. Gently peel the tortilla from the plastic lining the press and flop it on the very hot comal, or flat griddle, for about a minute on each side. Then toss it into a tortilla warmer to keep it warm til ready to use. Kurt's tortillas turned out perfect! For her part, Linda sauteed broccoli and mushrooms and added them to a bed of grated mozzarella cheese (an easy substitute for queso asadero) in each tortilla. She rolled them up, then layered the enchiladas with some salsa verde, cream, and the rest of the grated mozzarella, and then popped the concoction into the oven for a while. More salsa verde and cream and shredded lettuce, diced tomatoes, and cilantro were then added as garnishes. Complimenting the meal was Belen's best-ever guacamole, plus refried beans from El Paso, Texas, scored at Jumbo, a Chilean-owned supermarket in Palermo that carries a weird assortment of of imported foods catering to Mexicans (or gringos looking for Mexican food), Arabs, and Germans. Photos of the process and the results. SIDE NOTE: Since moving to Argentina last May, we have experienced painful withdrawal from Mexican food and its northern neighbor Tex Mex. We have been tempted to go to some of the few Mexican restaurant in Buenos Aires but always nix the idea after reading negative blog comments. No Mexican food is better than bad Mexican food, we say. We have no complaints about the Italo/Gaucho cuisine of our adopted country, but after three years in Mexico City in the early 1970s and many years since reliving the culinary experiences, Mexican food is like an addiction for us. On our recent trip back to Austin, Kurt ate Mexican food every meal except two over a period of five days. Now we can indulge here in BA, too. woww, great location that place where u have taked photo profile. Diagonal Norte has an amazing view.